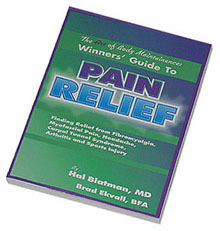 The Winner’s Guide to Pain Relief, by Hal Blatman, MD, and Brad Ekvall, BFA. Many years ago I was fortunate to be able to spend a week at the Blatman Pain Clinic. Dr. Blatman and his myotherapists taught me many ways to treat my pain and empowered me to optimize my quality of life. This book is as important for the chronic pain patient as it is for the athlete. Imagine a world in which you have a body-worker on 24-hour call, and when you called, this therapist arrived immediately and could tell you exactly where the pain originated and what to do about it, and how to prevent it from occurring in the future. This book will teach you how to be that therapist. This book is also an important time-saving tool for doctors, nurses, trigger point myotherapists, physical therapists, occupational and vocational therapists, massage therapists, and many other care providers as a neatly packaged “how-to” book of exercise, pain control and prevention. It is a book that can and should be used by anyone having muscle pain. This book does more than teach about myofascial trigger points (MTrPs). It teaches an integrated program of stretching, proper breathing, and ball acupressure. This book is written by a specialist in myofascial medicine, pain management and integrative medicine. He sees complex pain patients every day and enables them to improve their lives. He has put what you need to know into a wonderfully entertaining, informative and well-illustrated book. Realistic cartoon figures illustrate how to stretch and move in a healthy way that is integrated with ball techniques. You will learn where the MTrPs are and what to do about them. Your time with your health care team will be much more efficient because you will have this wonderful book to bring along as your guide. Invest in this book, and take the time to go through it and learn the stretches you need. Your body will tell you which ones they are, and reward you with increased range of motion. You must stretch and breathe appropriately as you do the ball work or your time and effort could be wasted. Once you get this book and start using it, you will wonder how you ever managed without it. Many people are diagnosed with fibromyalgia (FMS). FMS begins with some form of stressor that sensitizes the central nervous system. Although this stressor may be different for different people, peripheral pain stimuli (pain initiating from outside the central nervous system) can start the central sensitization process, and MTrPs provide that painful stimuli. No matter what the initiating stressor, MTrPs can perpetuate it. If FMS patients want some control over their pain, they must learn to treat the perpetuators. In many cases, the main perpetuator is stimuli from MTrPs. Those lumps, bumps and ropy bands on your body are not part of FMS. There are no “fibromyalgia trigger points.” Trigger points are part of myofascial pain and not FMS. FMS amplifies pain, but MTrPs cause pain. Chronic pain patients almost always have a myofascial pain component that is adding to their symptom load. For example, a case of arthritis may be otherwise well treated, but the TrP component may be causing treatable pain. Learning how to identify the pain patterns and treat the MTrPs can help improve function, relieve pain, and give you some control over your life. Myofascial pain is a high-maintenance condition, but if you can do the maintenance yourself, you can save time and money. This book is an important health care investment. It’s called the “Winners’ Guide.” Use the book. You will be a winner too. Why buy at Amazon through links from our website?